St. Mary’s University English Professor Diane Gonzales Bertrand was named a finalist at the Writers’ League of Texas Book Awards for her book of poetry, Dawn Flower (Pecan Grove Press). Authors are honored in five categories by the Writers’ League of Texas: nonfiction, fiction, poetry, middle grade and young adult, and picture book. In each category, honorees were distinguished as either Winner, Finalist or Discovery during the Texas Book Festival in October. Bertrand, who is Writer-in-Residence at St. Mary’s, is not new to receiving accolades for her publications. 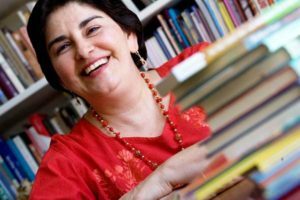 In fact, she has also received the 2008 Skipping Stones Award and finalist for 2008 Tejas Star Award for the bilingual novel “The Ruiz Street Kids/Los Muchachos de la calle Ruiz,” just to name a few. However this particular award was a special treat for Bertrand because it was inspired by her former friend and colleague at St. Mary’s University, Palmer Hall, Ph.D. (1942-2013). “I owe much to Palmer Hall who encouraged me to gather my poems into a book, and feel proud this book was one of the final poetry collections published through our own Pecan Grove Press,” Bertrand said.